First, thank you for the nice comments on my post about my mother's birthday. My family had a lovely time going out to eat and going to the thrift store. Someone had come in and bought ALL their craft books that day so I missed out on those, but I did find a great little pamphlet of honey recipes and some pressed glass dessert dishes exactly like mom's. The teens both found things they wanted and I found a mechanical egg beater for a 1.00 that just needed a minor fix. Mike fixed it and the Turnip is thrilled. She just thinks it's the neatest thing ever. 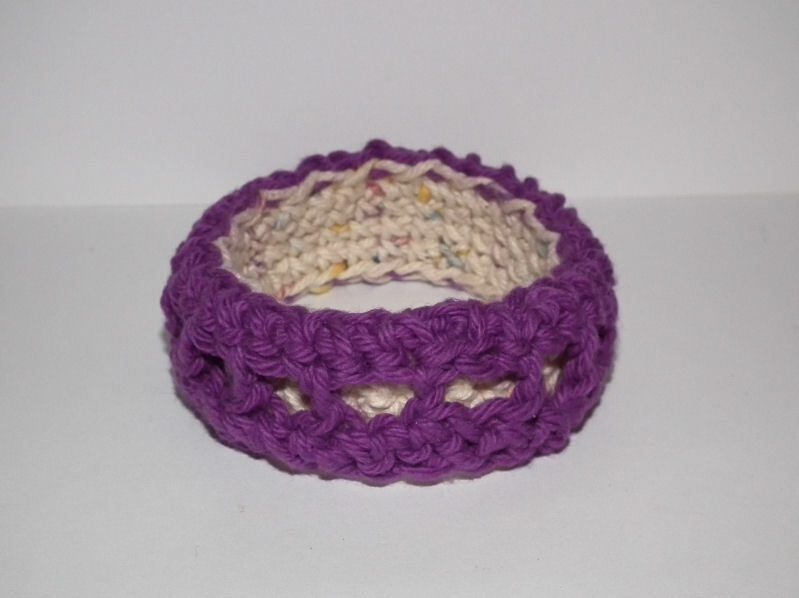 The ribbed crocheted bangles are still being worn a lot by my daughter. Last night I made her this one as well. It's very quick to stitch, 2 chains, 7 rows total, and 2 hook sizes, then sew it together. Round 1: Ch 1 (does not count as first stitch), sc in each stitch around, sl st in first sc to join. Break off yarn and weave in ends. The inside of your bracelet is done. Now to do the outside. Leave a 12-15 inch long tail for stitching one side of this part of the bracelet to the other part. Round 1: Ch 1 (does not count as first ch), sc in each stitch around, sl st in first sc to join. Round 3: Ch 1 (does not count as first ch), sc in each stitch around, sl st in first sc to join. Break off yarn leaving a long tail for sewing and weave in ends. 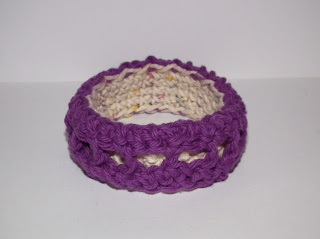 Put the first part of the bangle inside the part you just finished, and sew them together using a running stitch. Try not to pull the stitches tight, you want to have some give in the bracelet. Weave ends in. Silly...but thanks for the Coldwater Creek advertising on your site. Didn't know about the sale and just scored some great sweaters.